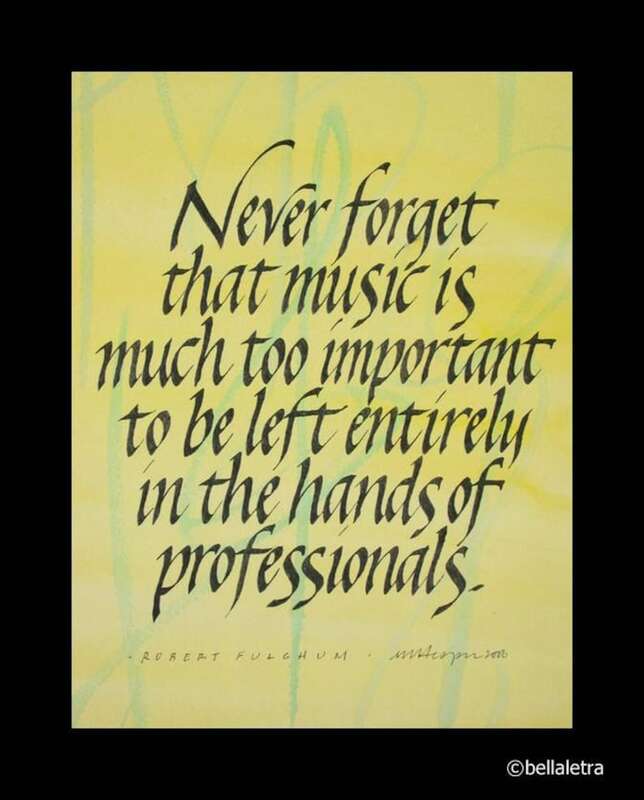 This Robert Fulghum quotation says that music is vitally important to everyone. As a music teacher and musician, it "struck a chord" with me. It would be a great loss to emphasize perfection at the expense of muffling a spirit of musical expression. The quotation is written against a backdrop of musical symbols in yellows and greens. The print is matted to a standard size available at craft or department stores. Just pop it in! Remember that the actual colors on the print and mat may vary slightly from the image depending on your browser and screen settings. Bevel-cut matted with Crescent matboard on repurposed cardboard backing. Absolutely beautiful print! The mat color is perfect. This will hang in a place of honor in our living room. I love this print. It is exactly as pictured when I ordered. I ended up changing the mat to a double mat; navy blue with gray inside mat. I put it in a gray frame. Love it! You can pay any way you like. The easiest way is through Direct Checkout. You can pay with your credit card through Paypal without setting up a Paypal account. After your payment is received there, I ship it. If you would like to pay with check, please allow 2 weeks for check clearance and shipping. Checks should be written to Margaret Hespen. For any damage encountered during shipping, please return the damaged order for a new one and reimbursement of your shipping costs. You can expect your item within 5-7 days of purchase in the United States, usually shipped through the US Postal Service. International shipping may incur customs fees according to country of entry, which are the responsibility of the buyer. Please communicate with me about expedited shipping and handling so I can send you a Paypal money request. For most orders, there is an additional $10 fee for receiving the item within 3 days of purchase. Prints are mailed in stiff recycled material. For any damage encountered during shipping, please return the damaged order for a new one and reimbursement of your shipping costs.